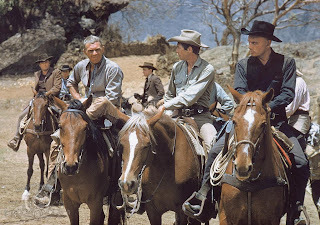 A highlight in the long history of the western genre, The Magnificent Seven opened the new decade with a marked departure from some long standing traditions. With heroic characters now aware of their deeply flawed heroism, a path was created for much more nuanced examinations of the men of the west. 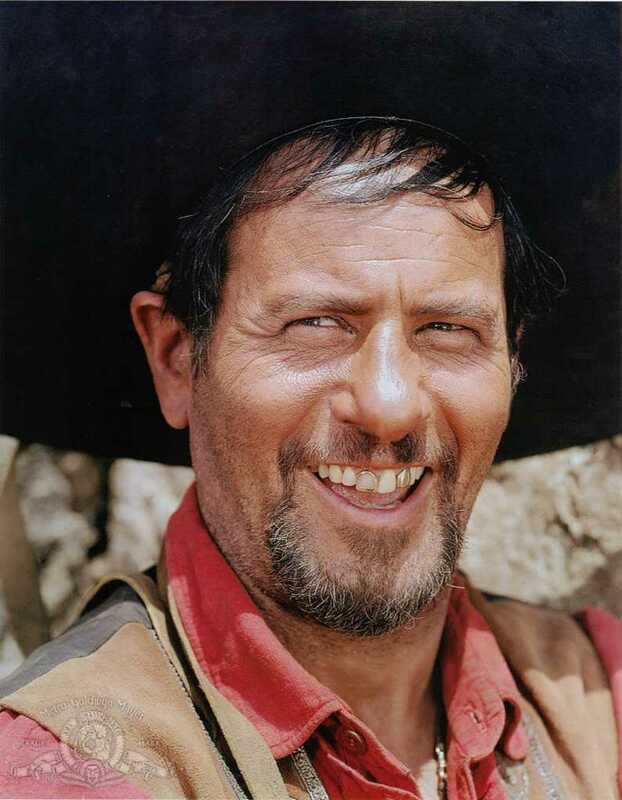 A peaceful Mexican village is being harassed by the bandit Calvera (Eli Wallach) and his band of rowdy men. Calvera rides into town at regular intervals, stealing what he needs but leaving the local farmers just enough to survive and tend their crops for another season, in readiness for his next raid. Fed up, the farmers decide to hire the mercenary Chris (Yul Brynner) to collect a group of gunfighters who can act as village guards. 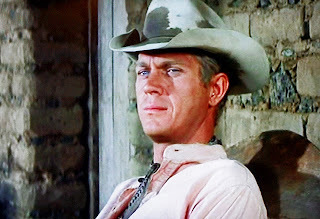 Chris teams up with another fast-draw Vin (Steve McQueen), knife expert Britt (James Coburn), the resilient Bernardo (Charles Bronson), old pal Harry (Brad Dexter) and the supposedly dependable Lee (Robert Vaughn). The young and over-eager Mexican Chico (Horst Buchholz) insists on joining them, despite Chris not believing him to be good enough. The seven men provide the farmers with weapons and training, and fortify the village with traps and defences. But the wily Calvera has a few tricks up his sleeve, and scaring him off will be no easy task. In adapting Akira Kurosawa's Seven Samurai (1954), director and producer John Sturges composes the heart of The Magnificent Seven as an exploration of the gunman's psyche. The story is a stout frame deployed to carry an unusually lucid trial of life through the barrel of the gun, and Sturges allows his seven men the opportunity to introspectively question their purpose. The dialogue between the men, and the interaction with the villagers, gradually shifts the narrative of heroism from gunman to farmer, the former riding out their days with little purpose except to kill, the latter laying the foundations for a better future. Chico: Your gun has gotten you everything you have. Isn't that true? Hmm? Well, isn't it true? Vin: Sure. Everything. After a while, you can call bartenders and Faro dealers by their first names. Maybe two hundred of 'em. Rented rooms you live in, five hundred. Meals eaten in hash-houses, a thousand. Home, none. Wife, none. Kids... none. Prospects, zero. Suppose I left anything out? Chris: Yeah. Places you're tied down to, none. People with a hold on you, none. Men you step aside for, none. Lee: Insults swallowed, none. Enemies, none. Chico: Now that's the kind of arithmetic I like! Chris: Yeah. I did too, at your age. The mercenaries accept their assignment for next to no money. They all arrive at their separate reasons to help impoverished Mexican villagers when there are plenty of better-paying work opportunities. It's the one, thin difference between men like Chris and the Calveras of the world: Chris convinces a bunch of gunslingers to fight for a cause, while Calvera's only cause appears to be living off others and causing mayhem. Chris, Bernardo, and Lee emerge as the most interesting characters. As Chris, Yul Brynner, all in black, is the good guy keenly aware of the limitations of his chosen life, wandering from one adventure to the next with no further expectations of a docile existence. The intelligence behind Brynner's eyes makes it easy to imagine that Chris could have been a doctor or sheriff had he chosen different paths, but that he is now content making positive contributions using the wrong methods. Bernardo is adopted by the children of the village, and unusually for a Bronson role, Bernardo is the most articulate in communicating life's rights and wrongs, peeling away the fake glory of the gunman and pointing the kids in the direction of their parents to find real heroes. It is an affecting role of muscular ability masking uncommon wisdom. Bernardo (to the three children from the village): You think I'm brave because I carry a gun? Well, your fathers are much braver, because they carry responsibility — for you, your brothers, your sisters, and your mothers. And this responsibility is like a-a big rock that weighs a ton. It bends and it twists them until finally it buries them under the ground. Robert Vaughn's Lee is not as well developed, but probably the most interesting of the seven men. It emerges that Lee's life of killing has caught up with him, and unbeknownst to Chris, he has lost his nerve. Whether he will regain his ability to fire a gun again remains an open question, and as he ponders his purpose in life Vaughn provides Lee with a haunted presence, a gunfighter not killed by the enemy but dead from the inside, all the same. Steve McQueen is all cocky smiles and wise-cracks as Vin, a star-making role packed with charisma, but absent the depth of some of the other men. Vin is where Chris was ten years ago, still enjoying the benefits of a life without responsibilities, and not yet aware of all the costs. On the wrong side of banditry Eli Wallach allows Calvera to be a somewhat reluctant gangster, brutal enough to steal from defenceless farmers but never heartless enough to close the deal on pure evil. The magic of the movie lies in the mixing of the cerebral elements with excellent set-pieces. Sturges works from a diverse palette, finding tension in an early set-piece as Chris and Vin have a meeting of the minds to counter some racism around a cemetery, passing through a euphoric initial battle between the emboldened farmers and the bandits, and ending with a spectacular few-against-many raid by the seven to finish the job or die trying. The action scenes are crisply edited, cohesively assembled, and noisy with the sounds of multiple guns and frantically galloping horses. To complete the movie's enchantment, Elmer Bernstein composed a legendary western music score unlike any before or since, a rousing, dauntless theme of chivalrous heroism. When seven men come face to face with their moment of destiny, they will gallop to a rousing tune of masculine gallantry. Chris: The Old Man was right. Only the farmers won. We lost. We'll always lose.